The Bauhaus Gallery is pleased to invite you to the 8th Art Expo Malaysia, held at MATRADE from 25 till 28 September. 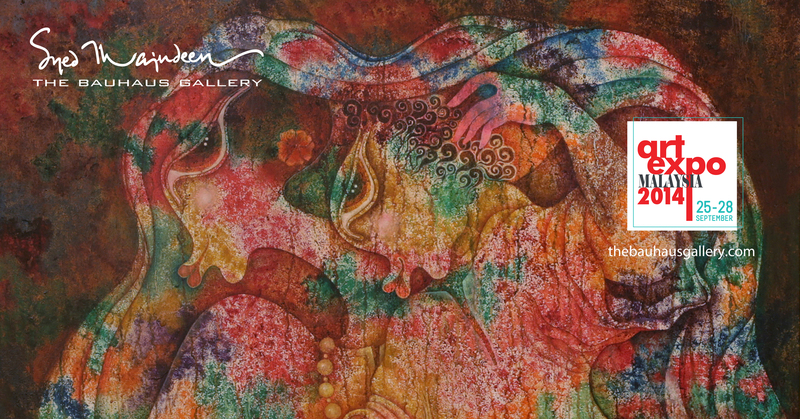 Visit us to view paintings by Syed Thajudeen, Nik Hazri, Syaidenaim and Stephen Menon. The expo will feature the magnum opus of Syed Thajudeen, The Royal Barge, from his famed Malacca Sultanate series which took the artist two years to complete. It portrays the grandeur of a time yonder during the reign of the great king Parameswara. Malacca grew into an important and prosperous international trading port in the Far East. Its riches can be seen on the exquisitely carved and gilded barge. Stephon Menon’s latest works from his critically acclaimed Mao series will also adorn the walls of the expo. Nik Hazri, who caused waves at last year’s Art Expo with the portrait of his muse, will again exhibit another variation from the series. Syaidenaim’s debut at Art Expo will display his abstract works with strong influences from the late Ibrahim Hussein. Mirror works by popular mirror artist and world record holder, Sirajudeen will also be made available. Limited edition prints of ink drawings and canvas prints signed and numbered exclusively by Syed Thajudeen will also be available at The Bauhaus Gallery. We would be looking forward to meet you.